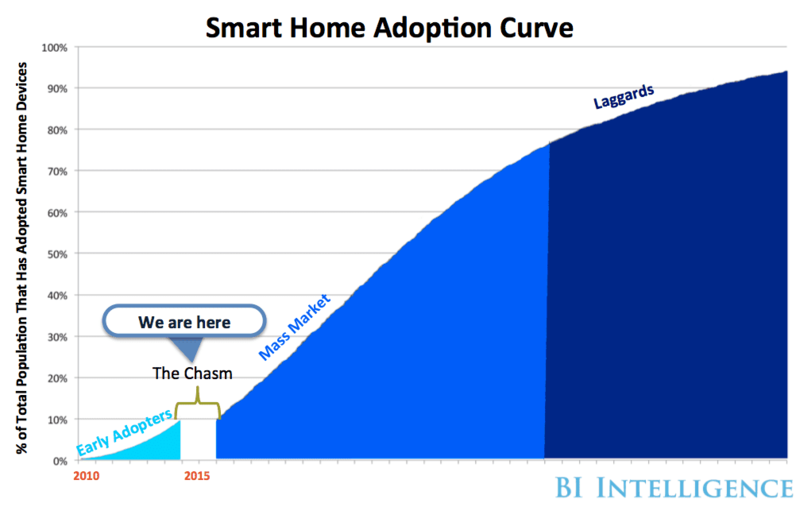 Business Intelligence thinks smart home adoption is crossing the chasm. My home is sorta smart, and I sorta agree. However, it’s a far bigger chasm than they know. The BI article, like most news, has a post iPhone perspective. Tech and smart homes did exist before 2007. Actually, I made my home smart in 2007. It was state of the art then, and still reasonably useful today – albeit totally obsolete. My home is wired. Every smart element is connected to a processor like a PBX. One of my smart home’s tricks is to water longer on hotter days. Each irrigation control runs back to my home controller. It adjusts those valves based on a wired temp sensor. If I wanted to consider more factors like humidity or rain then that would require more sensors, more wires, and more outputs. My system is very elaborate and reasonably reliable. I have control over most lights and sounds as well things like garage doors, sprinklers, and pumps. It was state of the art in 2007. It even had a text-based mobile client for my Windows Mobile phone. What we think is future-proof usually isn’t. I gave a lot less thought to the pipes in my house than the data runs, but it’s the pipes that keep things moving and will likely still be working in 50 years. Smart homes should have a year model in their title. If I was to do it again I’m not sure what I’d do. There’s the old guard like Leviton or Control4 that still think the mainframe model is right. Then there’s the new guard involving Google/Nest, Samsung, Sonos, and Philips that never saw an iPhone they didn’t like. There’s nothing new about IoT. So much of what I heard was cliché. “We will be able to detect a failure before it happens.” Shoot me now. What did change is the availability and costs of connectivity – it is now possible to connect everything – even things that we never thought we would want connected. There’s merit to connected plants, connected toilets, and connected people. So much of what IoT is discovering is what we already know in telecom. Things like network reliability matters, security and privacy matter, the transition from products to services is tricky (the billing part is the hard part), and so on. Everything will be connected. We are already doing it. There’s of course degrees. Facebook is a network of people and makes communications unlike anything ever before it. There’s smartphones, Fitbits, connected cars, etc. IoT just means means connected (and there are hundreds of ways to connect). I look around my home office and I realize almost everything already is connected. All my light switches are controllable from my PC, hard phone, and smartphone. My clock is always right thanks to its radio receiver. My TV gets s/w updates as well as Netflix and its satellite receiver is also connected to Internet and satellite. My desktop computer has cameras and microphones, a dect headset, a wired connection, and a wifi connection. My phones are obviously connected but also have cameras and network time. I have CCTV which is also visible on my smartphone. There are two stand alone (yet connected) video conferencing systems in my office (that might be a bit unusual). There’s also two printers, a networked scanner, a bluetooth speaker, and a connected thermostat. My in-wall home automation panel can, among other things, play Pandora music. This is today. What will it be like in 2025? I am not convinced the smart home is crossing the chasm. The connected home yes, but expectations of smart are higher than ever and devices are getting dumber. It is still too expensive, too complex, and most benefits are not that useful. I also think there is still too much of a divide between the cheap consumer stuff that is easy to work and the old-guard esoteric, quality stuff. Also the big problem with the smart home today is it’s too fragmented. One of my favorite features in my home office is an active call on my NEC PBX extension mutes the overhead music in my office. This is possible because NEC integrated with Leviton home automation. Unfortunately, NEC discontinued the DSX and Leviton seems stuck in 1990. While it’s a great feature I still can’t play loud music in my office because half my calls come in on my computer or smartphone – which are not integrated. Home automation has to be more than connected, it has to be inter-connected. Everywhere I look I still see flashing twelves (from the VCR era).